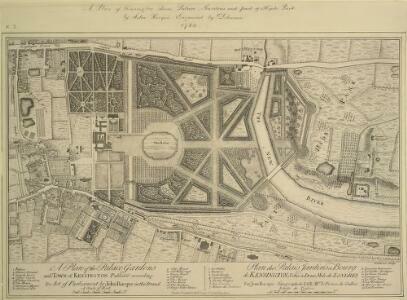 1 : 2136 This is a plan of plots of land for sale on the site of the Kitchen Garden in Kensington Gardens. The plan's title features at top centre, with compass star at top left and scale bar at bottom centre. The boundaries of the area for sale are outlined in blue, with the properties for which lease is not yet granted in yellow. Each property is numbered for reference, with key and terms of leases at bottom left. Standidge & Co. Description: The title of this plan of Kensington Palace and gardens appears in English and French, with scale bars and a key to architectural and natural features, in a panel below the plan. Kensington Gardens were originally attached to Nottingham House, which was bought in 1689 by William III and turned into Kensington Palace. Queen Mary took a great interest in the gardens and had them landscaped by royal gardeners in formal Dutch patterns. Uprooted by order of Queen Anne at the beginning of the 18th century, the Dutch gardens were replaced in 1726 by this Wise and Bridgeman design, including the round pond, the Broad Walk and the Temple Lodge.